The district known as the Ciutat Vella, or old city, in Barcelona was the entire city until the mid 19th-century expansion. The old city had developed very high housing densities and had associated problems of lack of light, air and open space. As the city expanded, the more well-off population moved out. 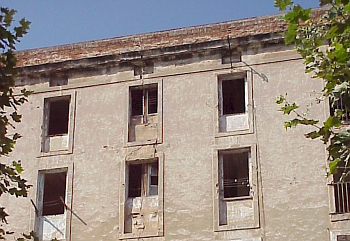 Slum conditions developed in various areas, and continue to the present day in several neighbourhoods, such as the Barri G�tic, Santa Caterina and Barceloneta. 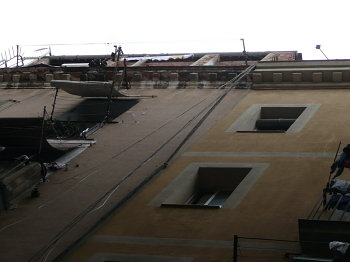 The highest concentration is found in the neighbourhood known as the Raval, and most specifically Southern Raval. This area was traditionally known as the Barrio Chino, or 'Chinatown', and, partly because of its proximity to the port, has been characterized by marginal activities and the highest levels of poverty in the city. It has also traditionally served as the gateway for new immigrants to the city, providing cheap lodging in very poor conditions, in the form of boarding houses, dormitories and subdivided apartments. The buildings in this area vary in age � some are several centuries old � and the existence of slum lodgings in the area can be traced back at least to the mid 19th century.